A nephrostomy is a procedure in which a tube called a catheter is placed into the kidney. An ultrasound or x-ray images are used to guide the catheter into the kidney. 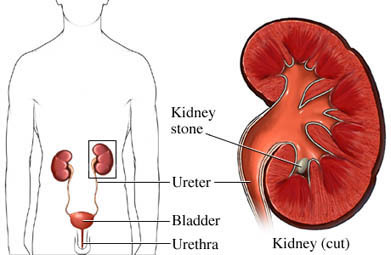 A nephroscopy through a nephrostomy may also be used to look at the kidneys and ureters before other procedures are done, such as kidney stone removal. This may also help your doctor make a diagnosis. Your doctor may do tests like a CT scan or ultrasound. You may also have blood and urine tests. Questions your doctor may ask include: Are you pregnant? Do you have any allergies to contrast material? Questions you should ask your doctor include: How long will the catheter need to stay in place? What signs should I look for in case there is a problem with the catheter? Do not eat or drink for 8 hours before your procedure. If you are taking medications, ask your doctor if you should take them the morning of your procedure with a sip of water. You will receive a local anesthetic to numb the skin on your lower back. An IV will be placed. You will receive a sedative, pain medication, and antibiotics through this IV. A nephrostomy is usually done in an outpatient setting. You will not need to stay in the hospital overnight. Ultrasound or x-ray images will be used to locate the kidney and guide the doctor. A needle will be inserted through the skin and into the kidney. A contrast material will be injected through the needle to better view the kidney on the x-ray. The catheter will then be placed into the kidney. The catheter will come out of your skin and be attached to a collection bag. A dressing will be placed at the insertion site. Urine will drain from the kidney into the collection bag. After the procedure, you will be monitored for 8-12 hours to make sure the catheter is draining urine. The urine may appear bloody at first. It will clear over time. You may feel soreness at the insertion site for several days after your nephrostomy. You will be given medication to help with the pain. Your collection bag will be checked to make sure the catheter is draining the kidney well. You will be shown how to care for your catheter. You will be sent home with extra collection bags and dressing supplies. You will be able to leave when your catheter is working and you are comfortable caring for it. Follow your doctor's instructions about activity restrictions and wound care to prevent infection. Be careful not to let the collection bag get too full before emptying it. Practice parameter for the performance of percutaneous nephrostomy. American College of Radiology website. Available at: https://www.acr.org/-/media/ACR/Files/Practice-Parameters/percutaneous-nephros.pdf. Updated 2016. Skolarikos A, Alivizatos G, Papatsoris A, Constantinides K, Zerbas A, Deliveliotis C. Ultrasound-guided percutaneous nephrostomy performed by urologists: 10-year experience. Urology. 2006;68(3):495-499. Wen X , Gao X , Li X, et al. One-step percutaneous nephrostomy in patients with a history of open nephrolithotomy: comparison with the fascial dilator system. J Endourol. 2007;21(11):1281-1285.